(SAVANNAH, GA)The center provides educational and advocacy services to children and families affected by autism and other similar developmental disorders in the Coastal Empire and throughout southeast Georgia. For more information, visit http://www.matthewreardon.org/. The donation was made possible through Fox and Week’s partnership with the Matthews Children’s Foundation and was combined with a grant awarded in 2017 through the foundation to enable the center to buy Chromebooks for all of its upper school students. Victor said autism brings its own set of challenges, but it also can bring out particular abilities. For example, she said, technological aptitude seems to be common among several of the center’s students and technology can enhance a student’s ability to learn and to more adequately communicate and interact within their environment. Chromebooks fit into that category, she said, and are particularly popular for educational use as they offer affordability, built-in security, automatic updates and a variety of classroom tools. 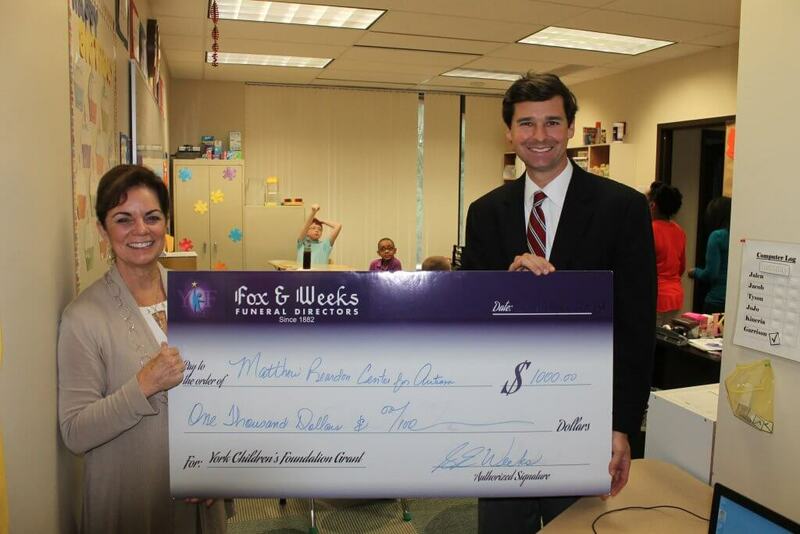 Fox & Weeks has now awarded nearly $40,000 in Matthews Children’s Foundation grants since 2012. Each time a family buys a casket at Fox & Weeks, a portion of the cost is donated to the Matthews Children’s Foundation (formerly the York Children’s Foundation) in the name of the deceased. The accumulated funds are then distributed quarterly through an application process to area non-profits that benefit children and children’s causes. Fox & Weeks is the only funeral home in Savannah that actively participates in the Matthews Children’s Foundation. Since its inception in 1992, the foundation has granted nearly $4 million to community-based, nonprofit children’s organizations nationwide. To qualify for a Matthews Children’s Foundation grant through Fox & Weeks, an application must be submitted and an organization’s activities must be primarily directed toward the welfare and benefit of children. Contact Fox & Weeks at (912) 352-7200 with any questions.